My father is well, getting on up there in age and loves nothing better than something sweet. He likes to go to Atwoods, not just for garden supplies but for their selection of old fashioned candies. At his age, I say, let him eat whatever he wants! I sometimes take a treat over there and today I decided to make some good old fashioned peanut patties. This is the kind we used to get at the ‘service station’ when we were kids. Round and red and oh so sweet. Course it didn’t hurt that we grew up in peanut country, that and the fact that Dad’s family once farmed most of the county in peanuts! I made these only once before and I used a glass candy thermometer which BROKE in the middle of the batch so noone got to eat any. Safety first! This time around I used a metal candy thermometer so that issue would never show it’s ugly face again. I used a big old pot and since we all learn as we ‘do’ I learned that this particular candy thermometer should be embedded deep (about two inches) into the product it’s testing the temp of. The big old pan I used was nice and heavy, and in the size of a dutch oven, which in all reality was much too big for the task at hand. Because the pan was wide and not an actual ‘saucepan’ the resulting mixture didn’t turn out ‘exactly’ the way it should have. These should be more flat and not mounded as they are in the pic. Why’d this happen? It had to do with not trusting my gut that the candy was at the soft ball stage and trusting the thermometer instead. Because I was trusting the candy thermometer (which in reality was not deep enough in the boiling peanut mixture) resulted in the candy cooking a wee bit too long. But you know what? They will disappear into Dad’s tummy just the same! Try new things! Make something you’ve never made before. Try new methods. We all learn by doing. And always go with your gut. If possible, use a deep heavy saucepan. Stir in the sugar, the Karo, the milk and the RAW peanuts and bring to a boil. 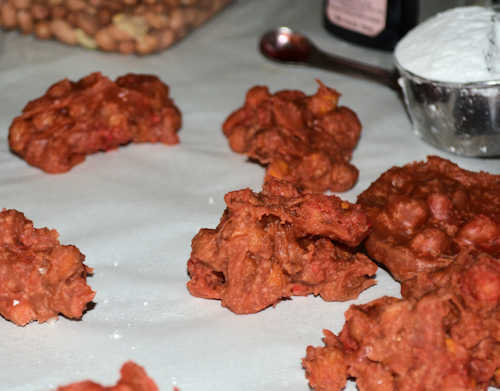 Reduce heat and cook for about an hour or until you reach the soft ball stage in candymaking. Stir often. Once you reach soft ball stage (which is about 234-240 degrees) remove from heat and stir in the butter until it's melted. Then add in the powdered sugar and food coloring and stir to combine.